About me: LOCATION! LOCATION! LOCATION! Hawks Riverside Lodging is centrally located only a short ride from the Rockhouse trail head or the Town of Gilbert. No trailering to access the trail system, ride directly from the lodge on your atv,utv,or dirt bike! Want to just hang at the lodge? Enjoy a relaxing day on the porch watching and listening to the river flow by, keep your eyes open for our beautiful Blue Heron or the deer that frequent the area. Spend the day fishing the beautiful Guyandotte river who knows you may catch a nice small mouth bass or Catfish! Sit around the camp fire and enjoy the sounds of the stream. Now that sounds relaxing! Also nearby you’ll find the Twisted Gun Golf course a true gem in the mountains! RD Bailey lake only about 30 min from the lodge provides plenty of oppurtunities to catch an array of fish(largemouth bass,catfish,stripers,smallmouth bass,crappie and many other of species live in the lake) the tailwaters are stocked with rainbow trout in the spring of the year! So come on down lets go riding in the mountains,fishing, or golfing! Or lets do all three! The lodge itself is very well equipped with a full size kitchen, heat pump, a maytag washer and dryer, full size bath and a spacious outside deck! 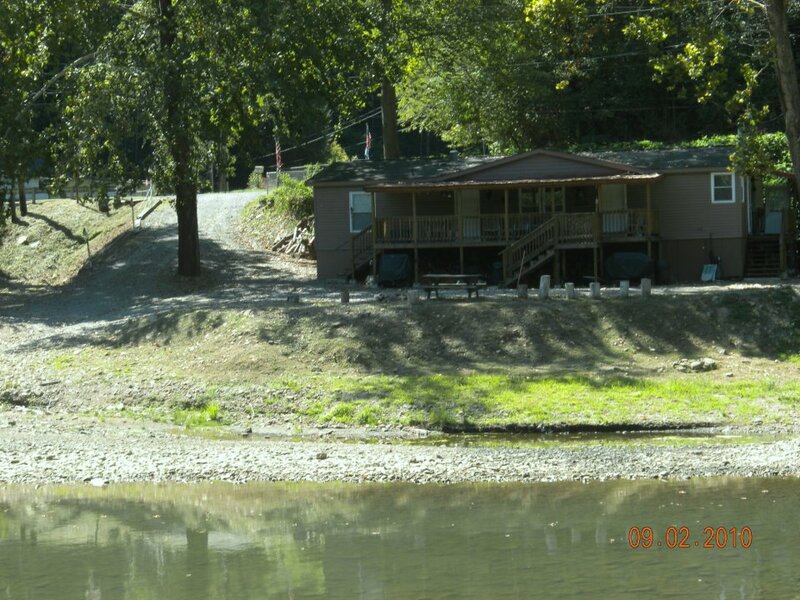 Very private on the banks of the Guyandotte River. We have been getting reservations at a increasing rate and construction is finished on the second unit. Please feel free to leave all your comments. We will use these to provide the best facility and value on the Trail system. GIVE US A CALL, SEND US A COMMENT, OR CONTACT US BY EMAIL AT *protected email* and we will answer any questions you may have concerning your stay!!!!!!!!! 304-664-9709 PHONE RATES: FIRST 2/$100.00/$15.00 EXTRA PERSON. WINTER RATES DISCOUNT!!!!!!!! !